These days there are countless materials available for kitchen countertops. But instead of giving you the pros and cons of each material, I’m going to break down six popular color styles so you can achieve the look you want with the material that suits your needs. 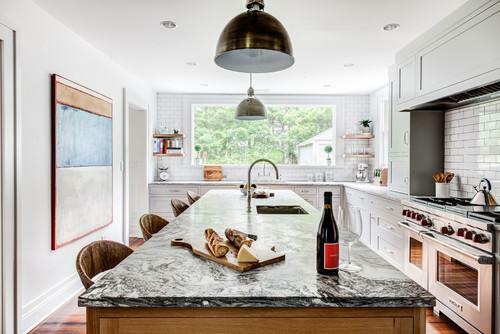 One of the most common and coveted countertop finishes is a stone or manufactured slab material, such as quartz, in a white or off-white shade with a light multitonal fleck or grain to give it subtle natural richness. This snowy, sparkling look works well in many situations since it is very neutral but also contemporary and fresh. The pale tone brings a sense of cleanness and lightness to the space with a twist of subtle sophistication. 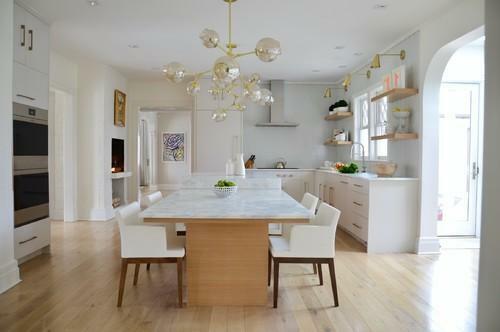 In more traditional kitchens, this is usually a better choice than a true minimalist white countertop, which can be too severe and fight with the elegance of other elements such as knotty woods, Shaker cabinets or lantern pendant lights. Softly flecked or grainy whites also work well paired with brass accents, such as these contemporary lights. Again, the subtle richness holds its own without fighting for attention and keeps the countertop from feeling too austere — great for a dining island where you want people to actually feel comfortable dining. – You have a traditional or transitional interior. – You want the space to look big and light without feeling clinical. – You want white countertops but don’t want every crumb and speck of dust to show. 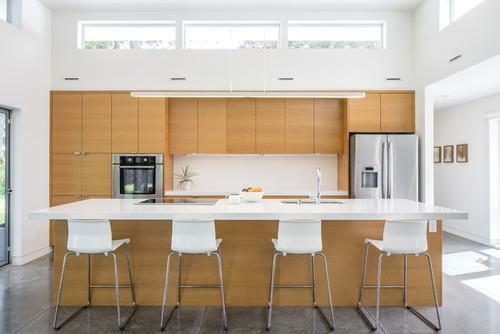 Pure white countertops, generally only available in manufactured materials such as Corian or Caesarstone, bring a contemporary, minimalist freshness that no natural stone can match. Luckily, these materials resist stains well, so they can stay a crisp white for years with just a little care. This stark look works well in contemporary spaces. As mentioned, the severity of a true white can fight a traditional decor, but in a modern space it feels appropriately crisp. It’s especially effective in small spaces, such as compact condo kitchens, paired with minimalist white cabinets to give the illusion of a bigger space. Here is another use for white countertops: Spaces that already have a great deal of bold character in the other finishes, such as grainy wood cabinets, can benefit from a super simple counter as a visual break. This is especially true for modern flat-front cabinets in a wood finish with a yellow-orange undertone. A pure white counter will keep the look feeling fresh and contemporary instead of retro. Lastly, white and blue is a classic nautical combination, so while off-white would also work, a pure white counter looks beautiful paired with blue-painted cabinetry. Despite both being chilly colors, the two together feel welcoming and always stylish. – You love crisp, modern style. – You have a small space that you want to look as big as possible. 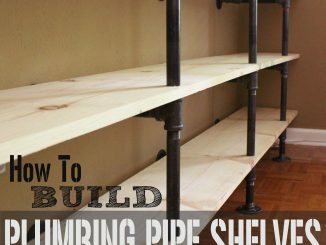 – You want to break up modern wood cabinets or other bold finishes. – You love a nautical white-and-blue scheme. Warm wood, with its inviting air and natural richness, is a great choice for infusing a cool, breezy kitchen with some approachable character. Crisp white kitchens feel a little more “homey” and a little less austere with a wood countertop. It makes a popular choice for transitional kitchens that balance traditional and contemporary elements, especially since classic wood fits into both categories. 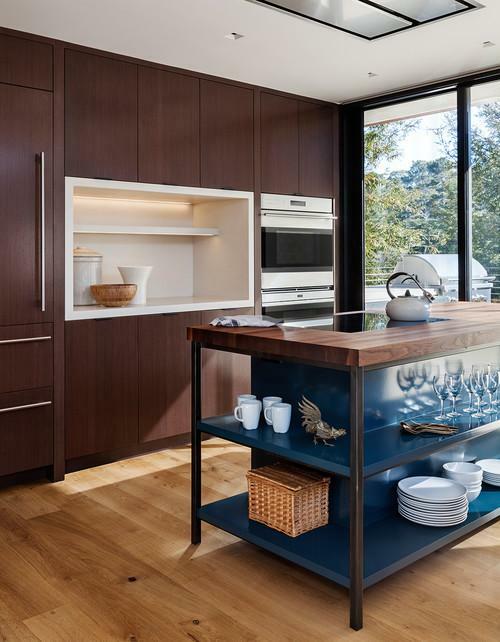 Wood counters, naturally, also work well in spaces that already feature wood cabinets — that is, if you’re a true wood lover and don’t mind it dominating the palette. Notice in several of these examples how wood only dresses the island counters. Wood in general is an excellent material to use for an accent counter (often on an island or a small “chopping zone” in butcher block), contrasting with nearby stone or solid-surface counters in a pleasing way. Lighter woods tend to have more of a casual or rustic feel compared with darker-stained options. Light-stained or unstained woods can have a cottage-inspired feel or a Scandinavian vibe depending on whether you pair them with traditional or modern accouterments. In either case, a traditional runner rug makes an excellent complement. Darker woods come off a little more formal and polished than lighter tones. They lend a certain gravity to a space, which can work well in areas that are already bright and breezy with lots of windows. When mixing wood counters with other wood finishes, it’s often best to stick to either warm or cool tones across the board. Red-brown woods are more traditional, while ashy gray tones have been a popular modern trend in recent years. Whichever tones you prefer, they will be less likely to clash if you stick to one family or the other. – You want an accent countertop to contrast with other surfaces. 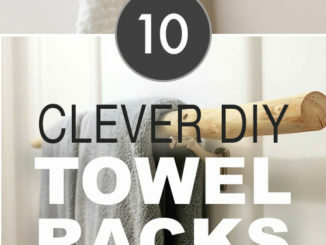 – Your white cabinets need a little warming up. – You want your space to feel more approachable and intimate. – You enjoy a dash of rustic charm. – You can’t get enough wood. Dark counters, in tones such as black or charcoal, can appear very gothic in some situations and perfectly harmonious in others. If you have dark cabinetry, dark floors or other rich and weighty finishes, a dark countertop will fit right in. 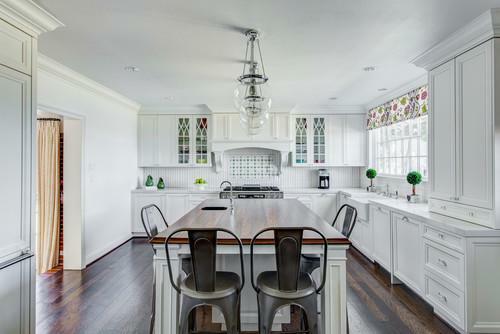 In this example, you can see that the white counter is the one that pops, compared with the island counter, which almost blends into the deep wood drawer fronts. If you’re going for a dark-on-dark palette, it helps to have lots of light sources, natural or added (or both). This will keep the space feeling cozy and sophisticated instead of just cave-like. Because white can sometimes absorb and dampen nearby colors, a rich, dark countertop can actually be the better choice to bring out subtle colors in painted cabinets. Choosing a dark gray rather than pure black will soften the look, so it’s usually preferable to stop at charcoal in most situations. Here’s a situation where dark countertops are nearly a must. When you’re using a tinted mirror backsplash to subtly open up the space visually, a dark counter will echo the deep, moody surface for a perfect complement. In this kitchen, the counter picks up on the black elements of the appliances, the dark legs of the furniture and the rich and complex parquet floors, so it feels integrated into the design rather than being a single exclamation point. Lastly, sometimes you just want that classic black-and-white look. 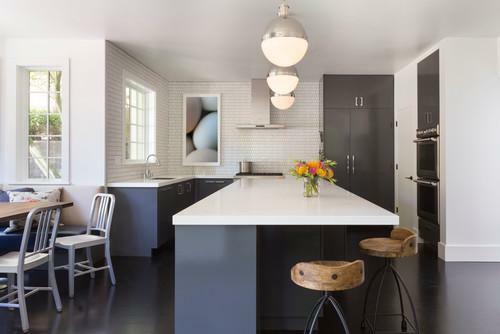 If you have a kitchen with crisp white cabinets and little actual color, or you have just a few small areas of counter, a dark or black stone brings some instant drama. Again, it’s never wise to have just one large black element in your design, as it may stand out like a sore thumb, so you’ll want to introduce other sprinklings of black such as elegantly simple black cabinet knobs and pulls. – You have dark cabinets and want the counters to blend in with them. – You have colorful, fun cabinets, and you want the hue to really shine. 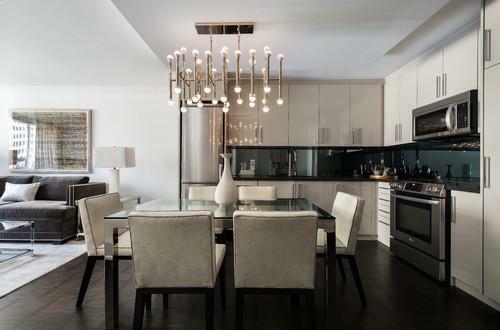 – You have a smoky mirrored backsplash, a trendy favorite in condos and modern homes. – You want to connect to other black elements in the space. – You’re aiming to achieve a classic black-and-white scheme. Soft gray countertops and other midtone shades, such as beiges or rich creams, are the most neutral counter options. 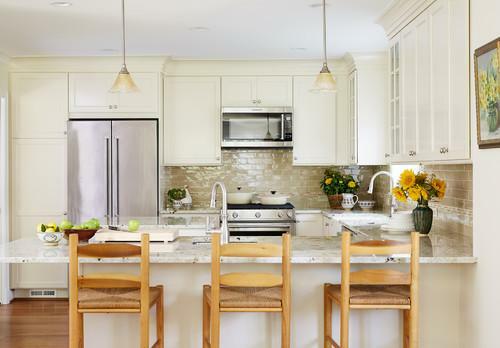 In this kitchen, with creamy off-white cabinets and golden yellow undertones in the backsplash and wood, the dreamy, creamy counters add to a harmonious, peaceful look, perfect for friendly family breakfasts. Softly flecked gray stone has a look similar to concrete, and it works perfectly in contemporary spaces with a bit of an architectural bent. It has the advantage of hiding the occasional spot while still looking clean and tidy and not too dark or busy. It’s great if you don’t always have a perfectly organized space but still want a put-together look. Because gray is the most neutral color around, it makes another excellent choice to pair with colorful cabinets, especially in a space with different cabinet finishes, as it can help tie light and dark cabinets together. If you have a black-and-white scheme, or espresso woods with white walls, and you want to soften the whole look a little, a midtone counter will bridge the very dark and very light elements so they meet in the middle. Gray is also a beautiful tone to pair with warm metallic accents. If you love a brassy faucet or sink, a gray counter will bring out those warm tones so they really shine. – You want a soft, friendly vibe with muted tones harmonizing. – You have colorful cabinetry or multiple tones of cabinets mixed together. – You have a black-and-white scheme that could use a little softening. – You love warm metallic accents and want to show them off. Boldly veined stone countertops can either make you stop and gaze in admiration or have the opposite effect and overwhelm your eyes. 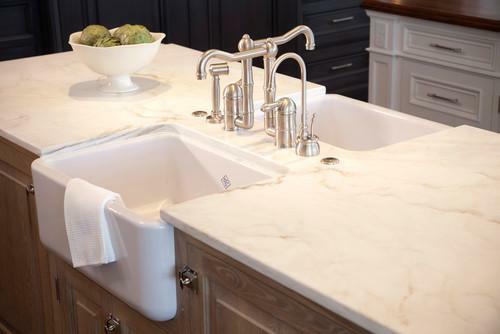 In general, the bolder the veining on your counters, the less drama you’ll want to add elsewhere. This waterfall counter (with the material wrapped down the sides) is relatively muted, but the large gray veins still bring enough character without any daring colors or other statement features. The size of your space will be a factor in determining just how dramatic a bold stone looks once it’s installed. This isn’t to say you can’t use a bold stone in a compact kitchen, just that it will feel even more dramatic in scale, meaning you probably will want to keep the other finishes very sedate. Notice how many of these spaces use the same dramatic stone for the counter and the backsplash, making for a truly singular statement. A dark, richly veined stone can actually feel less dramatic when paired with dark cabinets. Whether you use espresso wood or a modern painted gray coordinating a base tone in the stone with one of a similar darkness or lightness in the cabinets will help the two connect. Ultimately, the only way to tell how a richly veined stone will look with your other elements is to bring home the largest sample you can or take samples of your other elements to the dealer to see what tones are strongest in the stone. – You have a large kitchen. – You want the counters to be the primary statement. – You have dark cabinets to offset a dark, moody stone. – You can’t get enough visual drama.